"The start wasn't as perfect as it was supposed to be," said Michael. "Again I had a little dip where I lost out a couple of meters and then I saw Ralf on the inside and not knowing what strategy they were on, thinking they may be only on a one-stop, so I had to make sure I would be first in the first corner. So I used the maximum that the rules allow you, to move over once, and tighten up the line. That's the way you have to work unfortunately." It was a move that Ralf did not appreciate but he held his tongue. "It is between the two brothers," said Frank Williams, "but Ralf was not too impressed." As usual the Michelin tires took a dozen laps to get up to speed and in that time Michael was able to build up a lead of two and a half seconds and then suddenly Ralf was setting the fastest laps and pulling his way up on to Michael's tail. Within five laps he was there and hustling his brother. On lap 18 Michael made a mistake on the run down the hill towards the hairpin. The Ferrari ran wide after Michael locked up his rear brakes. Ralf went for the inside but Michael came back onto the line quickly and the moment was passed. "Other than that, I was pretty much in charge," Michael said. "I was in trouble in general in that first stint, the car handling wasn't so good so we made some corrections at the pit stop." At the first stop the Ferrari boys changed the front wing settings. At the second stop they modified them again. By the end of the race Michael had a very strong car. But by then there was no opposition. Ralf's challenge went off the rails at the pit stop. "I was looking in my mirrors when I left the pits and obviously I concentrated more on the traffic behind me than on the line." When he emerged Ralf was behind Coulthard's McLaren but it took Ralf only a couple of laps to get rid of David and then he was off again in pursuit of Michael. But this time the Ferrari was able to hold the gap and then came news of the penalty. It was a pretty small mistake but the FIA stewards were harsh. Ralf was given a 10-second stop-go penalty. That was basically the end of his challenge because by the time he had paid his debt to society he was back in fourth place having lost more than half a minute. Barrichello's one-stop race put paid to him on lap 44 and so Ralf was back to third but there was nothing he could do to stop Coulthard going ahead when it was time to stop for the second (or rather third) time. He got to the flag a rather disenchanted fellow. With Ralf out of the way the chase of Michael was led by Montoya. For once Juan Pablo had an untroubled time in qualifying and there was a feeling of momentum as he went into the race. It was good for his confidence and it showed. There was not much he could do to match Michael. "The car was very competitive," he said. "The first few laps of the race I took it really steady. I knew Ralf and Michael were going to go, and I said 'Take a couple of laps, get into it and just build up the pace slowly'". And that was what he did. At the end of the first stint Montoya was able to close to within three seconds of the two men ahead of him. He led for a lap before his own stop. The second stint was disrupted by a wild moment as he tried to find a way to pass David Coulthard for third place on lap 33. At the chicane Montoya went bouncing across the dirt. "I got really close behind him but when I hit the brakes I just locked the front tires," he said. "I didn't even try to turn. Just went straight. It was safer." That was the only adventure he had but at the end of the stint the gap to Schumacher had gone out to eight seconds. 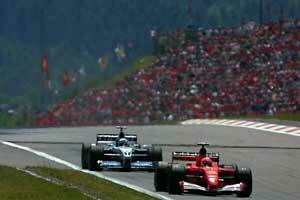 The final run to the flag saw the gap come down to four seconds but Montoya knew that Schumacher was pacing himself. At the end of the day Juan Pablo was satisfied. And so was the team. Michael ran to the flag enjoying the day. It had begun badly when the spare car failed as he was doing his recognition laps. It failed at the worst possible point, way down at the bottom of the hill. It was too far to run back in time to get into his race car and so Michael ran round in circles for a couple of minutes (it looked remarkably like panic) and then he commandeered a BMW motor scooter and without a second thought rode back to the pits (waving to the crowd), giving his brother's engine manufacturer a marvellous piece of publicity. It was an amusing interlude before battle commenced. In fact it meant little because his race car was in the garage and ready for him and he was back with plenty of time to get to the grid. In the end he sounded almost disappointed that Ralf disappeared with the penalty but a home win is a home win and Michael will take them whenever he can get them. Would he have beaten Ralf? "Under normal circumstances we should have been able to do it," he said. "But it would have been a very close battle." Barrichello chose to race with a one-stop strategy and a poor start dropped him from fourth to seventh at the start. And there he stayed until the pit stops began. When he pitted on lap 44 he was up to third place but the stop knocked him back down to fifth and there he stayed all the way to the flag. "It was rather a boring race for me," he said. It was however enlivened by a spin in the closing stages but he recovered from that without losing a place. When all was said and done the battle between Ferrari and Williams-BMW completely overshadowed the McLaren-Mercedes team. For some reason the team seems to have been knocked sideways in recent weeks. Perhaps it was the Newey Affair, perhaps the embarrassing technical glitches. But whatever the case the cars never looked very threatening and Ron Dennis seemed to be more interested in criticizing Formula 1 magazines (and getting them all mixed up) than he was in getting his team to improve. It was all very odd. Looking in from the outside one cannot help but wonder if the problem is not one of tire performance. Coulthard seemed convinced off that. "Unless the tire we have available to us works well on our car, I don't think we have something in the set-up that we can change," he said. The implication was that the Bridgestones worked better on the Ferraris. It was much the same as we saw at the end of last year. Mika Hakkinen made up a place at the start (passing Barrichello) but he did not seem to be anything like his normal self after that. He was on a one-stop strategy (as was Coulthard) but he had no defense at all when Barrichello came at him in the middle of the race. Rubens simply drove past. It was a very uninspired result but at least it was a result. The fastest laps of the race told the story. Coulthard's fastest lap was four-tenths of a second faster than Hakkinen's. And Mika's best was beaten by Luciano Burti in the Prost. The only man to get in with the top three teams was Jarno Trulli, who snuck sixth place at the start when Barrichello went away slowly from the start. But the Honda-powered teams were really nothing to worry the big boys on this occasion. Jarno ran around in sixth and would probably have ended up with a single point had it not been for an oil leak from his gearbox. This resulted in the gearbox seizing up completely on lap 45. Worse was to come a few laps later when the second Jordan spun out as a result of a traction-control failure. Frentzen's race was not good at all. He had qualified eighth and dropped to 10th at the start. He suffered big problems with his rear tires but was running eighth when the his car broke. "It is clear that we are not realizing our potential," said Eddie Jordan with alarming clarity. At the end of the day British American Racing ended up with the only Honda car to finish but Jacques Villeneuve's result was not one which would have had the cleaning ladies at Honda clearing the trophy cabinets. Villeneuve was full of praise for his car, his team, his strategy and his driving but did not have much good to say about his tires. "What hurt us was the fact that we were unable to get the best out of our tires," he said. "I could not have gone any quicker today." One wonders if the men at Bridgestone will be listening or whether BAR will have to go and see Michelin at the end of the year. Olivier Panis's race was compromised in the first corner. He had overtaken Villeneuve at the start but then everything became very cramped and Olivier lifted off and he went from 13th to 17th. And there he stayed until lap 24 when he spun off, probably as a result of a gearbox problem which was probably caused by an electronic glitch. Mixing it with the Honda brigade all weekend were the Jaguars and when the flag fell the two cars were still running and Eddie Irvine and Pedro de la Rosa were seventh and eighth. It was a steady reliable race. "I could not have done better today," said Irvine, mirroring the remarks of Villeneuve. Irvine blamed everything on the team's poor qualifying. De la Rosa spent most of the afternoon battling with Villeneuve and managed to get to the line 1.7secs ahead. "That was the best team performance of the year," said Bobby Rahal. Of the other teams there was not much really to report. Sauber qualified ninth and 10th (with Kimi Raikkonen ahead of Nick Heidfeld again) but in the race there was nothing much to report. The problem was blistering tires and that meant that Raikkonen ended the day 10th. Heidfeld had a collision with Jean Alesi on lap 54 and was forced to retire with a broken driveshaft. Benetton managed to get both cars home with Giancarlo Fisichella 11th and Jenson Button 13th but both drivers complained about their cars sliding around a lot. The team now goes to Magny-Cours looking forward to a new engine package and a better result. Well, it could hardly get worse. Burti dragged his Prost home to 12th place and he too talked a lot about blistering tires which caused him to go off early on and meant he had to pit to clean out the radiators. The team did not change the tires because of a radio mix-up and so Burti's struggle went on. After his second stop he was very quick on new rubber and set a faster lap than Hakkinen. Jean Alesi would have finished 11th but he spun off while trying to pass Raikkonen in the closing laps and so he ended up classified 15th. On this occasion Minardi got one car home. Alonso struggled with an engine problem but he got to the finish in 14th which was good when you consider that he has not seen the checkered flag for a long time. Alas Tarso Marques had no such luck. He had an electrical problem which caused the gearbox to malfunction and so he went out on his eighth lap. The Arrows team had nothing much to say. Both cars retired: Jos Verstappen with an engine problem and Enrique Bernoldi with a gearbox failure.